If you reside in Detroit, MI and are currently looking to rent a party bus, then stop what you are doing immediately. Here at Rockstarz Limousine and Party Bus, we specialize in providing our clients with an amazing experience from them moment they set foot in our party bus, and with your own professional driver to look after you, it means you can just relax and enjoy your evening. When searching for a party bus in Detroit, you will want to be absolutely certain that it is more than capable of fulfilling your needs. With this, we have no doubt that we will not only meet your expectations, but surpass them. We take absolute pride in our Detroit party bus rental options and we can guarantee that you and your party will have a night to remember. Our party bus is fully equipped to provide you with your very own nightclub on wheels. Furthermore, we also understand that atmosphere is everything, so not only have we created the maximum amount of space inside so you can invite more people, but we have also included our top of the range sound system and laser light show that just gives that extra something to the evening. 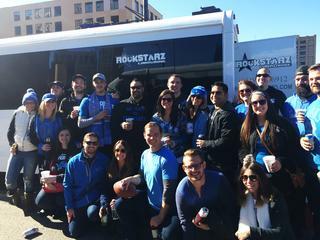 You are able to use our Detroit party bus service for any kind of celebration whether it be a special birthday or perhaps your bachelor or bachelorette party. No matter the reason, you can rest assured that you and your party will enjoy every single minute that is spent with us. So, if you do live in the Detroit area and are on the look out for a party bus for whatever the occasion may be, then give us a call here at Rockstarz Limousine and Party Bus. Alternatively, you can use the reservation form on our website and a member of our team will be in touch at the earliest opportunity.